Benirus Manor is a house for sale on the east edge of Anvil. It's the most cost-effective house, due to the nature of its upgrade; it is given as a quest reward instead of an item to purchase. 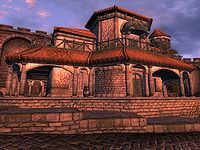 The home can be purchased from Velwyn Benirus for 5000 gold, which begins the quest Where Spirits Have Lease. During this quest, ghosts can be found throughout the house. When the quest is completed the house is upgraded and its cells are reset; any items stored there at that time will be lost. 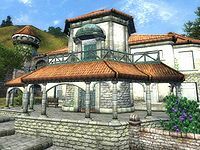 Also of note is that, unlike the purchasable homes in other cities, fast-travel is not possible from within Benirus Manor. The house is divided into two cells, Benirus Manor and Benirus Manor Basement. Upon first entry of the manor, everything looks rather dingy. The foyer features a faded rug and table, a chair and a bench, and a broken bookshelf. In the sitting area, a table and two chairs sit on a rug in front of the fireplace, one of them knocked over. The cupboard on the north wall contains drinks, and beside it sits an empty table with a painting propped up against the wall behind it. A chest of drawers containing clutter lies on its back in the southeast corner. A painting hangs above the fireplace. The door on the south wall leads to the dining room. During Where Spirits Have Lease, a pot falls from the top of the cupboard and spills a skeletal hand and a Scrap from Lorgren's Diary. After the restoration, the foyer gets a new rug and the sitting area is refurnished with another new rug. The painting is hung on the north wall, the furniture is righted, a bottle of Tamika's West Weald Wine and a bottle of cheap wine are placed on top of the cupboard, another bottle of Tamika's and a bottle of Surilie Brothers Wine are placed on top of the chest of drawers, and two tapestries are hung on either side of the chimney, with another next to the door to the dining room. Before the restoration, the dining room features a food cupboard in the alcove on the west wall. A single chair stands upright, and a chandelier tops a pile made of another chair and a broken table on top of a rug. After the restoration it gets a new rug and table, as well as an extra chair making a total of three. The table is set with two strawberries, two carrots, an orange, a cheese wedge, and a tomato. The other door in this room leads to a stairwell with two tapestries on the west wall, a drinks cupboard in the northwest corner, and a table and chairs on the north wall. The stairs lead up to the second level, and the door under the stairs leads to the basement. After the restoration a chair is placed between the tapestries. A tapestry hangs on the wall at the first landing, and a painting hangs beside the balcony that overlooks the stairwell. The door at the top of the stairs leads into a bedroom with a double bed on the south wall and a tapestry hanging above it. This is where sleeping progresses the related quest. A chest of drawers and a cupboard in the northeast corner both contain clutter. After the restoration the tapestry above the bed is replaced and another is added on the opposite wall. The door in the northwest corner of the bedroom leads to a hallway with a balcony overlooking the lower floor sitting area. The door on the west wall reveals the exterior balcony. The tapestries on either side of the balcony door are replaced, as is the rug on the floor. The table between the chairs holds an apple. The door on the east side of the hallway leads into a small room with a desk and chair on a rug, a tapestry above it, and a painting opposite the tapestry above a chest of drawers and chest that both contain clutter. After Benirus Manor is restored, the rug and tapestry here are replaced, and the painting is readjusted on the wall. An apple and a loaf of bread can be found on top of the desk. The door into the basement leads down a set of stairs to the first level. In the southeast corner, three crates and a barrel contain clutter. The northeast corner holds four more clutter barrels and another barrel containing food. The chest on the east wall also contains clutter. On the north wall opposite the entrance a cupboard containing more clutter sits next to three more clutter barrels. The alcove in the northwest corner near the stairs leading down holds another clutter barrel and three wine racks holding a total of eleven bottles of cheap wine, nine bottles of Surilie Brothers Wine, and six bottles of Tamika's West Weald Wine. The second set of stairs leads down to the lower basement level. In the alcove at the foot of the stairs are two more crates and two barrels, all containing more clutter. 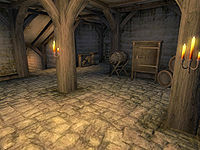 Around the curved hallway another room holds four clutter crates, two clutter barrels, a food barrel, two cupboards containing clutter, and a chest that holds more clutter. On the south wall, a circular design glows on a "Sealed Portal". During the related quest, Velwyn Benirus opens the sealed portal. In the entryway, a cairn bolete mushroom grows on either side, and human bones are scattered about. The table on the east wall holds a pickaxe, two knives, a hand scythe, and tongs. 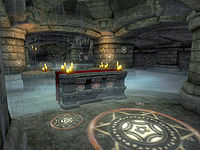 The desk on the west wall contains clutter and holds a copy of the Tome of Unlife. At the end of the entrance, Lorgren Benirus' skeleton lies on an altar. Two skeletons lie in the large room, as well as various other human bones. Two more cairn boletes grow in the alcove at the south end of the room. The overturned dresser in the entrance area and the cupboard in the dining area are removed upon completion of the quest. All other containers in the main house are safe storage regardless of the quest stage. The ghosts that appear after you first sleep in the house will respawn every time you reenter the house, so the house may become an unlimited source of ectoplasm until the curse is lifted. 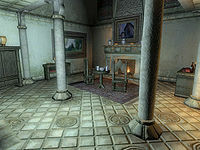 Sleeping in the unrestored house for the first time does not cause you to level, but will cause Lucien Lachance to stop by and initiate the Dark Brotherhood questline. Even after completing Where Spirits Have Lease, unlike other owned houses, you will be unable to fast travel from Benirus Manor. An odd graphical glitch may occur which makes it difficult to navigate through the house. ? This page was last modified on 7 January 2017, at 23:15.